No one wants to get the news that they have cancer or that someone they love has cancer. With Breast Cancer awareness month, October, coming up, it is important to bring breast cancer to the front of our thinking. While I personally have not had breast cancer, two very strong women in my life have: my grandmother and my aunt. And while they both battled hard, they both had it easy. I say easy in a very loose sense. No battle with cancer is easy. The effects on the body and the effects of treatment are brutal. Watching my husband deal with prostate cancer, stage 4, has opened my eyes to so much. My grandmother, while having to go through chemo and radiation, also had one of her breast removed. Even though she was diagnosed in the early 80s, she never had another reoccurrence. She lived to 95 years old. She passed away 2 years ago of age. My aunt, had to bear chemo, but was able to by pass radiation. It has only been 3 years since her diagnoses, but the doctors are optimistic that she won’t have a reoccurrence. Watching these women, women who seem untouchable with how strong they are, shows anyone can be touched with cancer. in fact, 1 in 8 women will be diagnosed with breast cancer. I encourage you to get involved with the Susan G. Komen foundation to help others with breast cancer. You can help by participating in an event, fundraising, volunteering your time, or advocating for a cancer patient. Now there is a wonderful opportunity for you to get the most impact from your support. This partnership with the Komen Foundation will help support men or women who have breast cancer, or those who may develop breast cancer in their lifetimes. It also helps support the families and loved ones of these people affected by breast cancer. 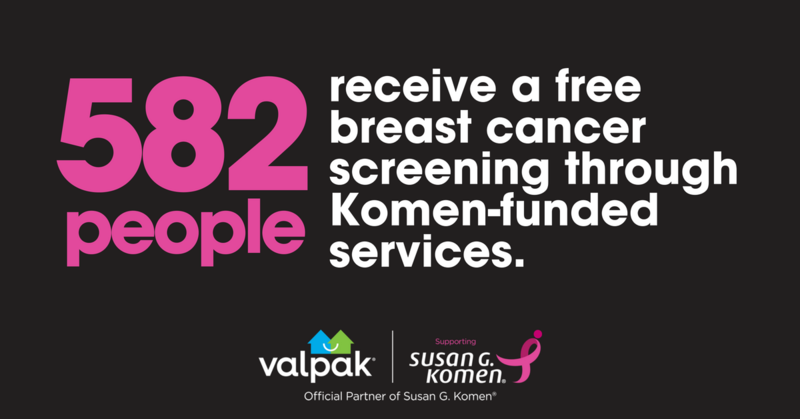 In 2018, Valpak will donate at least $50,000 to Komen and will encourage donations and support activations through local and corporate partners. 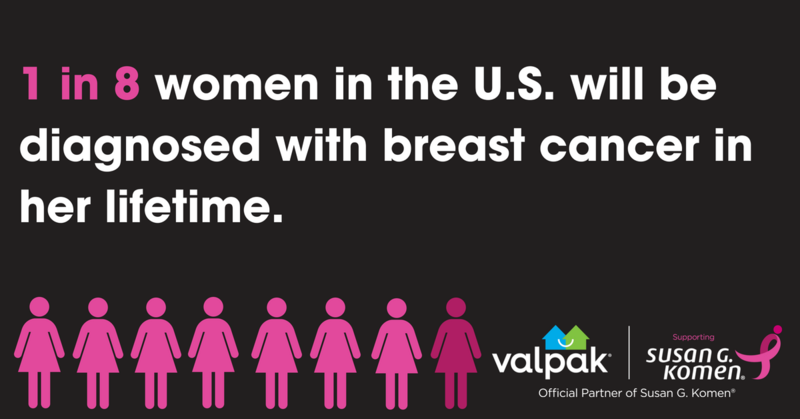 You can join Valpak and help in the fight against breast cancer. As mentioned above, there are several different ways you can help. If you’d like to help by donating, you can do so at this link. You can also show your support by taking part in the Race for the Cure. Look here for events happening in your area. If you sign up for a local event, be sure to use this code: DealPro (case sensitive) during your registration so you can get $5 off! 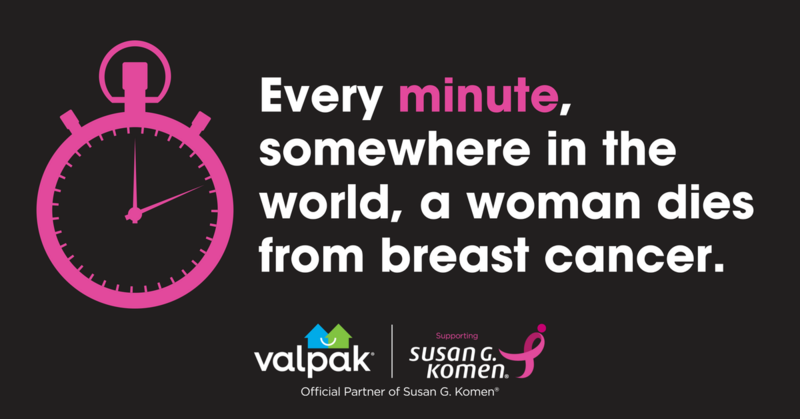 The Susan G. Komen Race for the Cure® Series is the world’s largest and most successful education and fundraising event for breast cancer ever created. The series of 5K runs and fitness walks raises significant funds and awareness for the breast cancer movement, celebrates breast cancer survivorship and honors those who have lost their battle with the disease. You can run it or walk it – so don’t worry about what kind of physical shape you are in. This is an opportunity to give back, as well as to celebrate the survivors. Again, here’s the link to donate. Thank you for your support!